This individual act is about one's personal, artistic analysis of traditional Sufi dances and their interpretation. Western influences form a very important component in each part of the act, however, noticeably differently designed. This is about physical feats meeting mysticism, East meeting West, the past meeting the present. The starting point of the performance is a question, if we are in a relationship with another person for real, or only with our own vision of our partner. Poetic images show relations that become distorted with time passing by. A man is confronted with an ideal of masculinity created by a woman. The new performance featuring 6 dancers and 4 street lights. The two choreographers once again started creating together after a period of separate works. The music is composed by the extremely talented musical genius Nicolas Jaar and costumes are made by a world known fashion designer Kedem Sasson who creates straight from his gut feelings. As a choreographer of shapes and patterns his work appears on stage as sculpted, asymmetrical, surprising games of fabric. Eliran Silver, who is taking part in the performance, is also responsible for lighting. According to Far Eastern traditions, Chi is life energy, causing change, reproduction, movement. “Up Chi“ is the sound that we make when we sneeze and implies an uplifting of the Chi. At the end of an activity, at the end of a holiday; as soon as the sun goes down, we feel at times “DOWN“. A situation that makes us feel soulless, we are left empty. Before a party, before a meeting, in a spring morning, we feel "HIGH", the excitement, the curiosity, the joy elevates us. And then, unexpectedly, a word, a departure, from what seems as a failure again we are shrouded by "down pulling down". “Up chi down chi" touches the meeting point between the two and brings to us a different observation to "UP“ and “DOWN“, the road on which we climb and the road on which we descend. The work allows us to accept them calmly and with maturity like two sides of a mountain, as we stay put and the sun and the moon change places. A traditional festival dance teachers meeting in an improvised dance jam session. This year again accompanied by a respectable German electronic wizard Michio Woirgardt. Quadrans as ¼ of a whole. The whole as a person looking for himself in the complexity of human relationships. Mini-stories of seven artists full of plastic means of expression, dance vibrations, metaphysical gestures. The endless relationship between man and woman with an ironic-sarcastic tone materializes in the form of thoroughbred dance and physically demanding partnering. Stage personas tired of the endless fighting each other often fall down on the ground to be returned by a computer to the game called Life. The very contemporary staging oscillates between dance abstraction and theater theatricality, full of expressive acting-movement characteristics of female-male psyche, as well as of humor and irony. 1. Crack, chor. : V. Šoltýs, 20min. 2. Atlantis, chor. : B. Nahálka, 12min. 3. A few lost words, chor. : L.Vágnerová & P. Mašek, 45min. 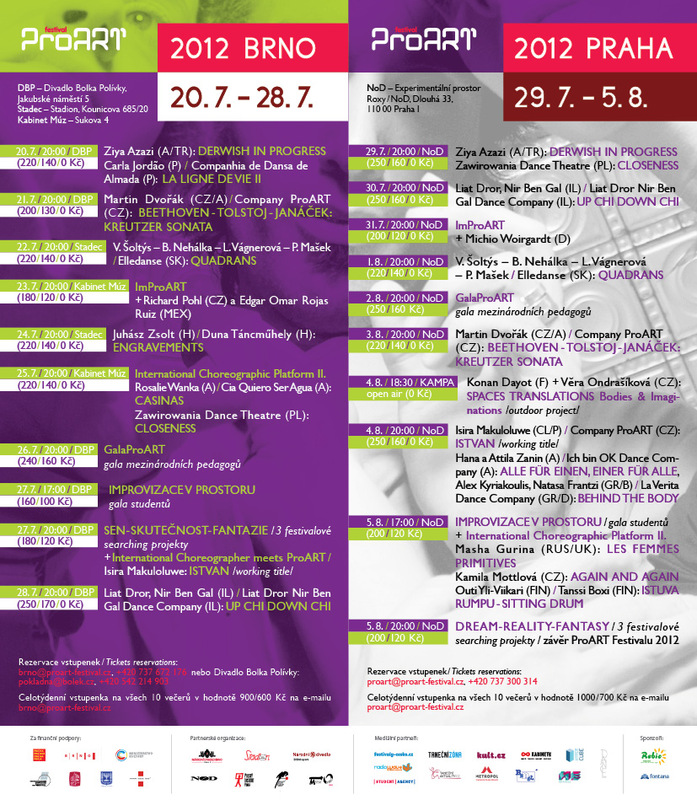 Gala of domestic and international personalities – teachers of ProART Festival 2012 – in extracts from their repertory. Účinkují: Konan Dayot, Martin Dvořák, Josef Formánek, Natasa Frantzi, Eran Gisin, Karolina Kroczak, Alex Kyriakoulis, Maura Morales, Věra Ondrašíková, Peter Strenáčik, Michio Woirgardt and Hana Zanin. A seven-day project whose aim is the search for dance invention in an outdoor environment (parks, forests, along the river) and discovering in them the sources of dancer´s inspiration. Isira Makuloluwe, a choreographer working on the route between Sri Lanka, France, England and Portugal, creates for domestic ProART Company to the music of a Czech composer Miloslav Ištvan. Everyone has his own personality, his own dreams and feelings, things that following him all time. All these affect the decisions and the way of living. How can we live without obligations and for how long should we carry them with us? La Verita Dance Company tries to show how we can live with restrictions and if there is any “light” that can eventually lighten our shadows and lead us in new directions. Gala of the participants of festival workshops (dance-creative writing-guitar) under international teachers leading – Martin Dvořák, Josef Formánek, Natasa Frantzi, Eran Gisin, Karolina Kroczak, Alex Kyriakoulis, Paul Leclaire, Michio Woirgardt a Hana Zanin. Again and again we try to define our goal. Unfortunately, we forget soon that the path that will lead us there is more important than the destination itself. Two women imagine themselves in a primitive world, outside of bounds of modern society. Without a preconceived idea of how “femininity“ should look like, or a need to appear “normal“, they develop their own, personal versions of it, and perhaps of two different kinds (active-passive, strong-light). These two versions could be in harmony, in conflict or simply coexist and sometimes swap roles. Can we dream ourselves out? Are we a product of our own reality? In the center of performance is a fusion of a live percussion instrumental music and contemporary dance. On the stage, there are three dancers and a musician who is playing a large variety of percussion instruments. The performance paints a series of moving pieces of artworks from different times and themes in front of the audience. 3 festival searching projects of Maura Morales + Michio Woirgardt (dance), Peter Strenáčik (singing) and Štěpán Pácl (acting).